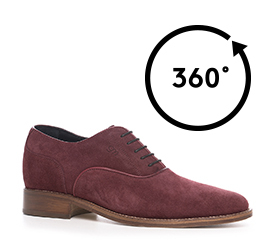 Elegant handmade Oxford with upper in burgundy suede and real leather sole. A shoe with an invisible inner elevator system to choose up to 3.1 inches (8 cm) featuring the exclusive Goodyear stitching that makes it even more comfortable and durable. The GM craftsmen allow to customize the footwear according to the specific requests of each customer.